I have posted close ups and swatches yesterday, but I would like to include them once more here for the sake of completeness. 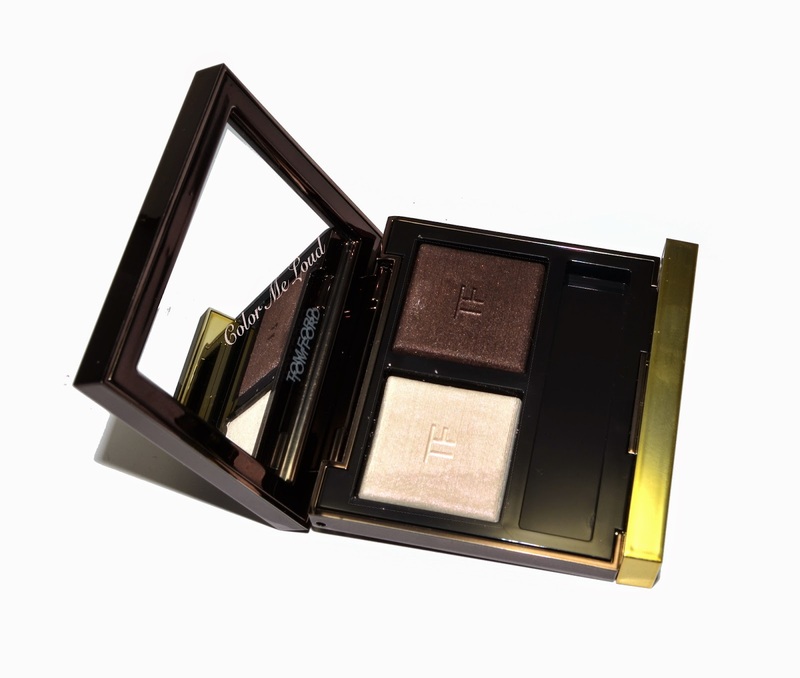 Tom Ford Eye Color Duo #01 Ripe Plum consists of one pale, semi transparent opalescence shade on the left. This one has pink duo chrome quality to it. On the right there is a deep plummy brown win satin to shimmery finish. The formula is wet & dry, so if you want more intensity, you can damp the brush a little. 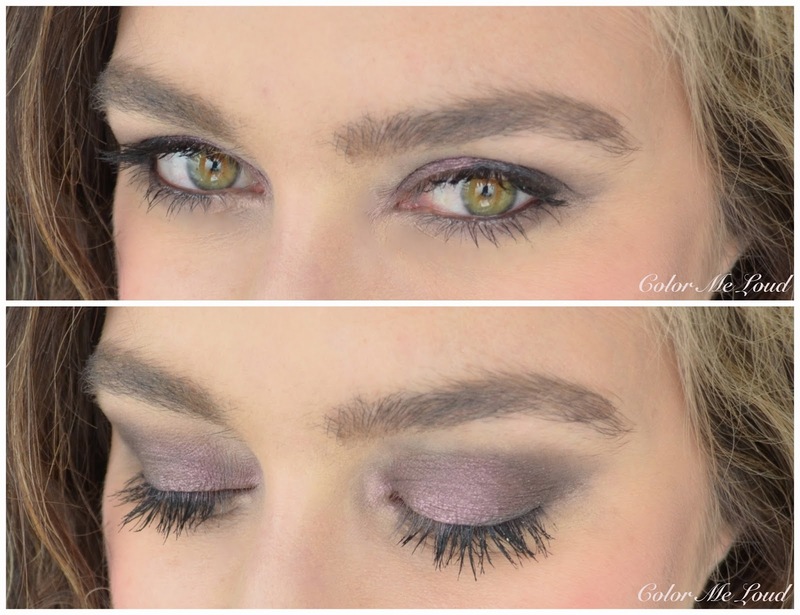 The duo also layers beautifully and becomes an stunning iridescent purple on the lids, it is so beautiful. 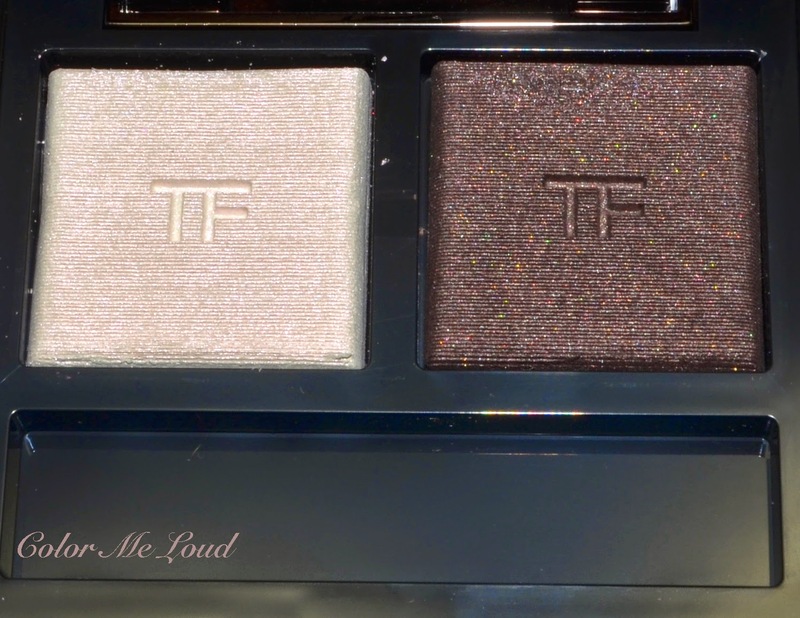 If you already own some quads from Tom Ford, you might be wondering how the deeper shade compares to the others. I have compared it with the deepest shades of Enchanted, Seductive Rose and Orchid Haze for you. You can see that the deep shade in Ripe Plum is not all that plum after all. Enchanted and Seductive Rose both pull more red/plum. Seductive Rose is closer to but darker than the layered shade of Ripe Plum. 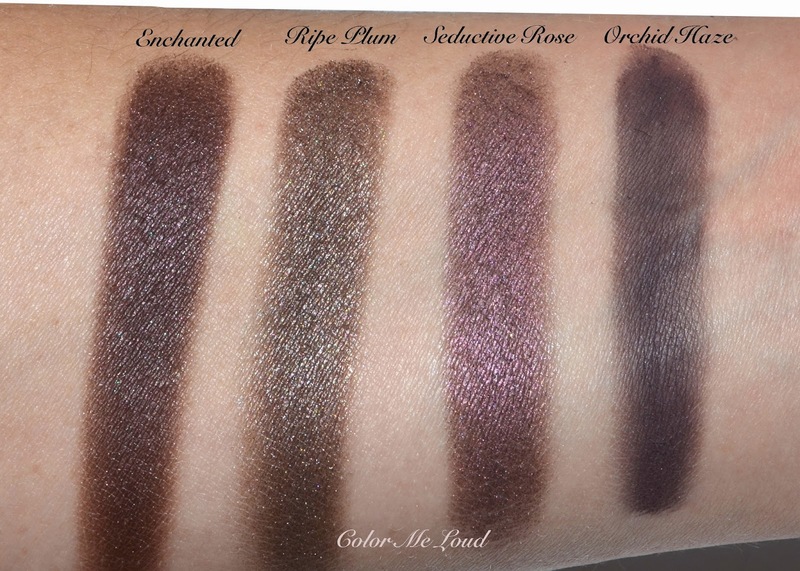 Orchid Haze has a matte deep eye shadow, which is very close in terms of color but not finish. 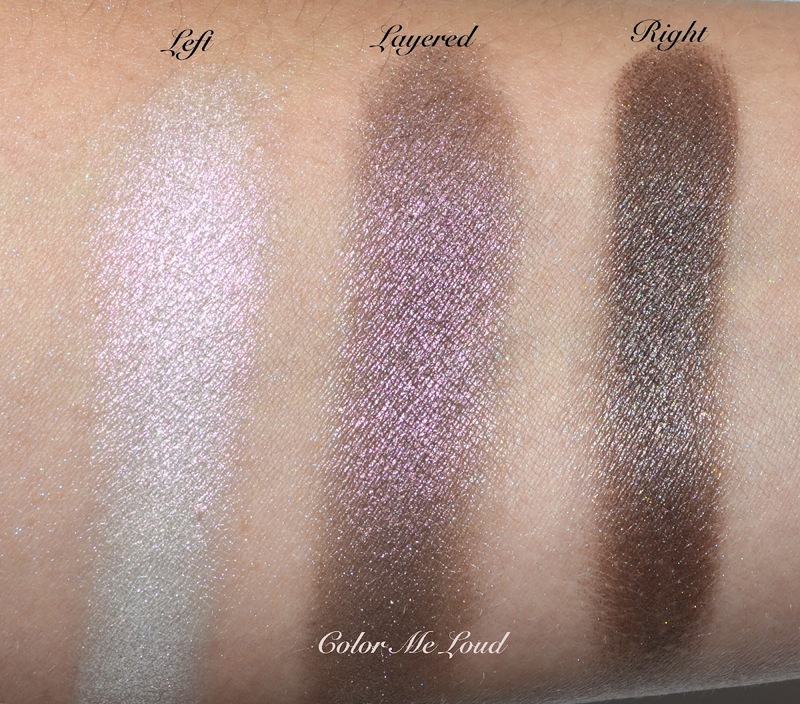 It is important to mention though, I have found Enchanted to me more buttery, swatching better. On the eyes though Ripe Plum performed just as well. I haven't compared the lightest shade because I really don't have anything like that. I believe MAC had a close shade last holiday in their plum bag. This one though is semi transparent. The only close shades I can think of are from Suqqu, which are more shimmery, less duo chrome. Here is Ripe Plum in action. Let me start by stating that I couldn't capture all the awesomeness going on which made me visit the bathroom like twenty times today. Under low light, the iridescence becomes so beautiful, it is something to see in person. 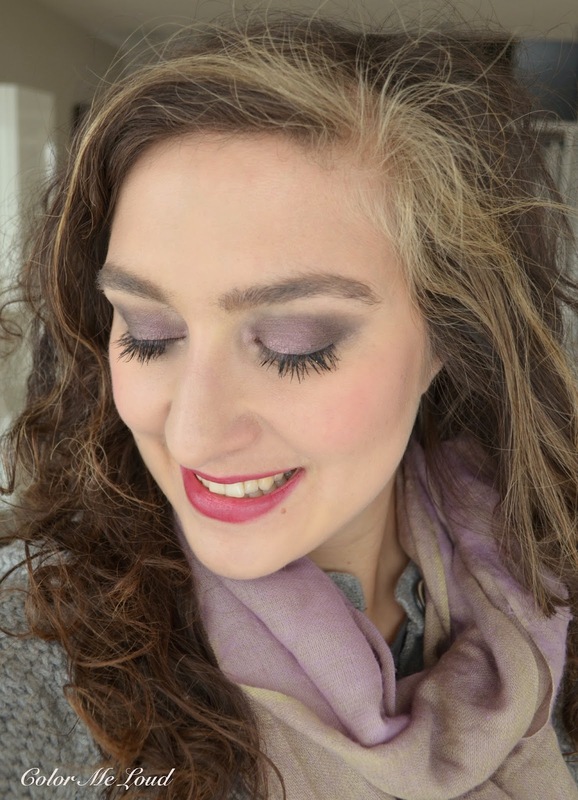 I started by applying the dark plum all over the lid and blended over the crease with a clean brush. I then added the opalescence pink in the middle of the lid, blending it towards the inner corner. Afterwards I sprayed some Fix+ on my brush and added just a small amount of the light shade on the center only. This way I got a beautiful gradient effect. This look stayed put all day, over 14 hours and counting. I loved it so much, I didn't want to remove it upon coming home. Now what I like most with these is that they are not too metallic nor shimmery. They have a different type of finish with a gorgeous iridescence. You can probably achieve similar color combination of light pink opalescence over plum, say with new Armani Tints or Nars Dual Intensities. But the finish would be different. Nars is more metallic, Armani is close but since it is liquid, on the lid it doesn't look so smooth (it accentuates the fine lines a little). Final thoughts: I liked it on the eyes even more than I imagined I would. The deeper shade is a stunning neutral, not too loud. Once it is combined, the resulting effect is very unique, it is not metallic nor too shimmery. I would call it iridescent. All thumbs up for Ripe Plum. I am not even more curious about the other two! How do you find the idea of semi transparent opalescence shade in there? Do you have any shades which are close? Disclaimer: The product in this post is provided free of charge for my consideration. I am not paid for this review, all opinions are honest and my own. Ahhh this is SO pretty!!! Now I definitely want it! Super lovely look you came up with, Sara! That opalescent shade is actually genius! hi sara!! at first, i was a bit disappointed that there wasn't a bronze or brown shade. but, i do love the ripe plum shade. it looks gorgeous on you. i'm not sure how it would look on me being very pale with blue eyes i' don't know if it would be too purple for me??. i was also thinking of trying his cream shadow in spice. i managed to find and purchase another chanel's new moon from the summer collection. but, i'm still on the look out for more neutral shadows on the bronzey side which seems so hard for me to find. do you have any suggestions? xo. the plum in this one is really rather a brown. Only once it is layered, you see the purple. Very pale, blue eyes: It would look even better because you can get away with using only the light shade all over and not layer all that much. Spice is a nice one, on your complexion Platinum may also look nice. If you have blue eyes though, Spice will make them pop. Ooohh Ripe Plum is definitely YOUR duo Sara!!! But i love it equally too... and it definitely outperforms Crushed Indigo! Can see your excitement here, cool stuff!!! Hahaha Pia, thanks, if you like plums, go ahead, this one is really unique. 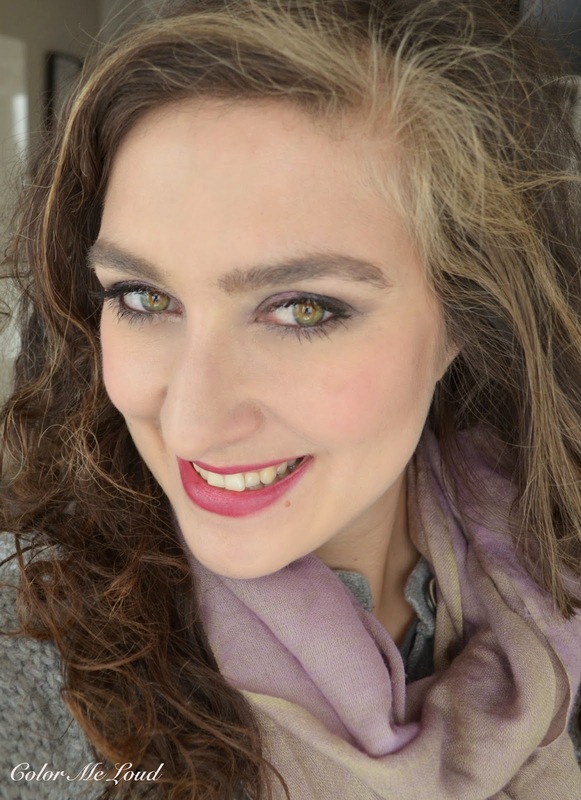 Have you tried duochromes from L'Oreal last summer? I bought out of curiosity and could not manage the look with duochromes - while one eye turns blue, another is rosa. This mismatched effect with different colors on my eyes when light falls from different angles, it was weird to me. Does this light eyeshadow does it too? Hi, green duo review will be up soon, I am hoping in a few days. I am right now a little over capacity, there are so many lovely products to review. I also appreciate that Tom Ford is very creative with textures. I haven't tried L'Oreal duo chromes. It sounds like fun though, it sounds like it was multi-chrome. I wonder how I missed it. This one doesn't have the effect you are describing, it is more like iridescence all over. Yes, please do. I will also review the other two, not all of them perform the same, so please wait. They are just pre order now, and they will be released in stores too, so it is not too late. Beautiful when layered! Love it, need it.))) Sara, do you think it's similar to Chanel Illusion d'Ombre #92 Diapason and Diorshow Fusion Mono #871 Olympe? Thanks. Diapason is more red, this one is more brown. Olympie is more purple, they are all gorgeous, this one is a little special because of the ombre effect you can get while layering. Wow, it is stunning when layered together! I think I might end up buying my first Tom Ford product ever! When I first saw these, I thought I'd be able to pass on them. Now that you've done a look, I realize I need to save up and hunt these down. The look is absolutely gorgeous. LOL Tatiana, I will post about the other shades too so stay tuned. another reader left a comment in the last swatch review and told the same. I don't have Iceland duo, hence I can't compare them. This one is made to layer though, with some transparency if that makes sense. Oh this look on you is beautiful!! Didier looks so nice as well! I am probably going to pass (am not sure where this sensible Stacey has come from) but you have made me want to dig out my TF Seductive rose with your swatches! love love Seductive Rose but don't pass on the whole collection. There is a green and a blue and I am sure you would love that iridescence which I can't capture with the camera. I keep coming back to this post fighting my lust this duo. So far am loosing the battle. Sara, can you delete this right above me? I messed it up trying to get an avatar... Sigh... Thank you! Now I didn't know how to delete it but I think I managed that lol. The pictures were so beautiful, it was not easy. yes there are really very versatile and come very handy once you are rushing. I love how that looks on you, the pinky top coat really adds something special to it. I might pick up one of the duos though the price point puts me off a bit. I know, they are a bit expensive compared to the quads. Their finish is so unique though, that justifies for me owning them. Nowadays it is frost galore and to find something special is hard.